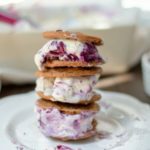 Creamy and tangy blueberry lemon cheesecake ice cream is sandwiched between two crispy cookies, creating the perfect cold treat on a summer night. This post is sponsored by Oregon Blueberries. All opinions are my own. It’s blueberry season, and we are currently working on lining the deep freezer full of blueberries to last us until next year (check out my video on the easiest way ever to freeze blueberries!). We are also enjoying them fresh, and in as many recipes as we can possibly imagine. Blueberry picking is one of my favorite summertime activities. Since moving to Oregon last year, we’ve made sure to head out and pick as many blueberries as we possibly can handle, and now that we have a deep freezer, we can handle a whole lot of blueberries. Have you met my 3-year-old? She could easily eat her weight in blueberries. 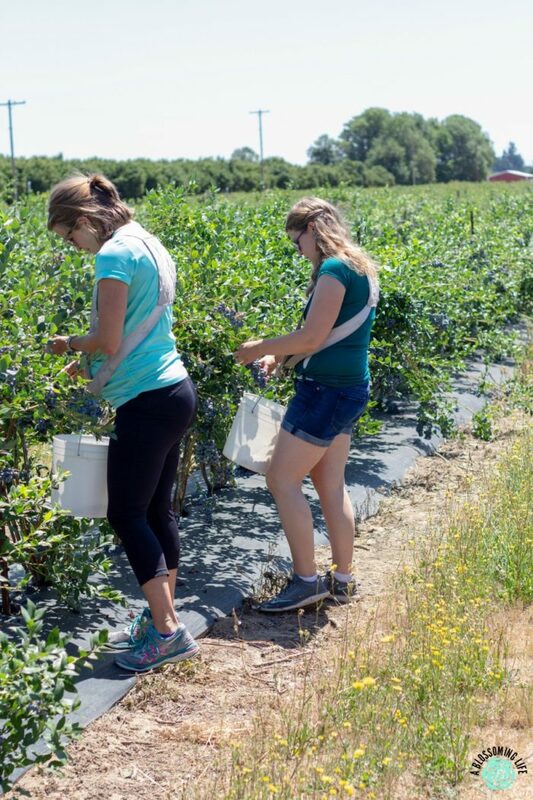 This year we started going to a newer U-pick blueberry farm, Kiger Island Blues, in Corvallis, Oregon. This farm is absolutely beautiful, and all the people are so kind. I grabbed a few friends and we headed out on a mission to pick lots of ripe berries. There is nothing better than picking blueberries with friends in the warm summer sun, surrounded by rows of blueberry bushes brimming with ripe blue fruits, and listening to the wind and birds in the distance. We had so much fun talking, picking, and sharing stories with one another. Life has been so crazy lately that it feels like we don’t get to spend as much time together. Blueberry picking is a great way to spend quality time with loved ones, and you get an awesome reward for your efforts. Unless you are with a wild 3-year-old. Then you will spend half your time convincing her to come back to the row you were in. Or is that just me? Blueberry picking is simple living at its finest. But you know what is better than picking blueberries? Eating them… specifically, eating them with ice cream. 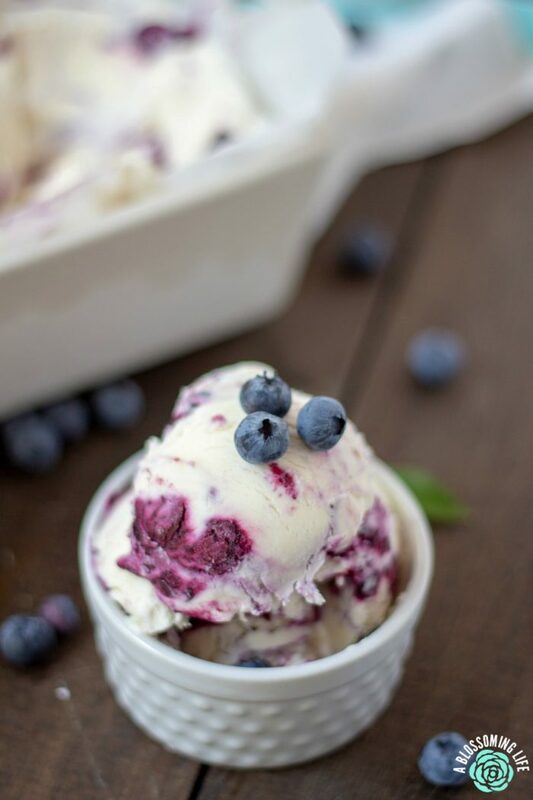 This no-churn blueberry lemon cheesecake ice cream (say that 10 times fast!) is so creamy and delicious on it’s own, but then you add crispy chocolate chip cookies? Forget about it. So good. Ready for the recipe? Scroll down! 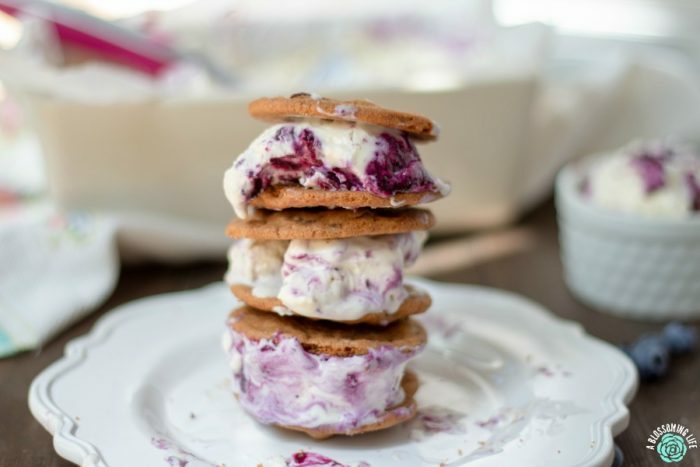 To make these amazing Blueberry Lemon Cheesecake Ice Cream Sandwiches, you’ll need some blueberries. 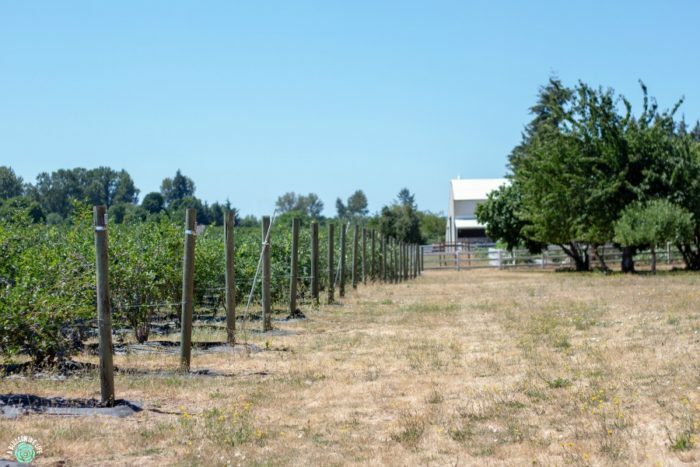 If you live in Oregon and want to go pick your own blueberries, head over to the Oregon Blueberries’ page to see all the U-pick farms in the area. Kiger Island Blues has become one of my new favorite farms because of the beautiful area, but also the owner is so sweet. Last year she started doing fundraisers for different charities. People can come pick to raise money for that year’s charity. I love this idea – picking for a cause. 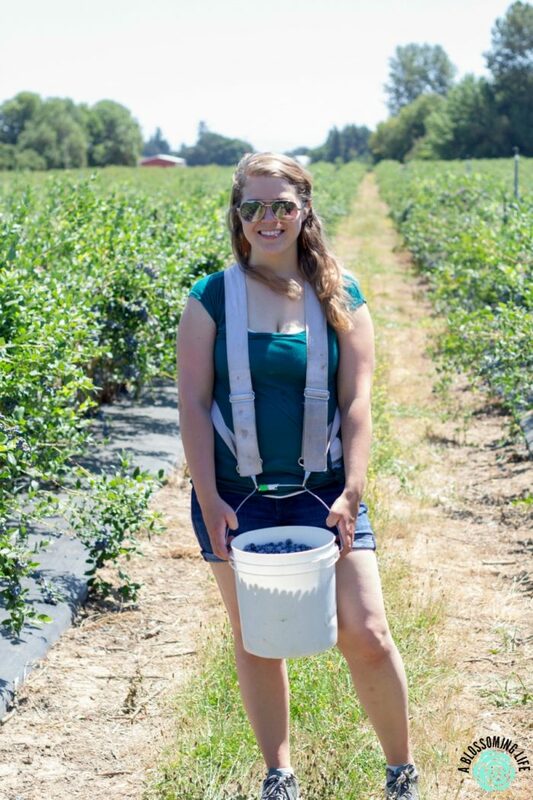 Picking blueberries at local farms has been a great way for me to get to know the area since moving to Oregon last year, and I love that there are so many places to choose from! And until I can plant enough blueberry bushes to keep my family in blueberries all year, I’m more than happy to support my local farmers – especially if it means I can put the fruits of their labor into treats like this. Obviously, our family loves blueberries and we try to incorporate them into as many recipes and dishes as possible. What’s not to love about these healthy and sweet berries? They contain antioxidants, vitamin C, K, magnesium, calcium and more. Studies have shown that blueberries help with memory (help slow the rate of cognitive decline) and as a mom with two young kids, I need all the blueberries I can get (source). Even though this looks hard, I promise it’s simple. You don’t even need an ice cream maker. In a medium-size saucepan, place blueberries, maple syrup, lemon juice, and lemon zest over medium heat. Cook until blueberries burst and sauce starts to thicken. Allow sauce to cool. If you are impatient (like me) or want to do this quickly, you can spread the blueberry sauce onto a cookie sheet and place into the freezer for a few minutes. In a stand mixer (or regular bowl), pour heavy whipping cream and sweetened condensed milk and whip until stiff peaks form. While on low speed, add in vanilla and cream cheese (a spoonful at a time). Line a freezer-safe dish (a bread pan works well!) with parchment paper and pour in half of the ice cream mixture, then top with half the blueberry sauce mixture. Repeat. 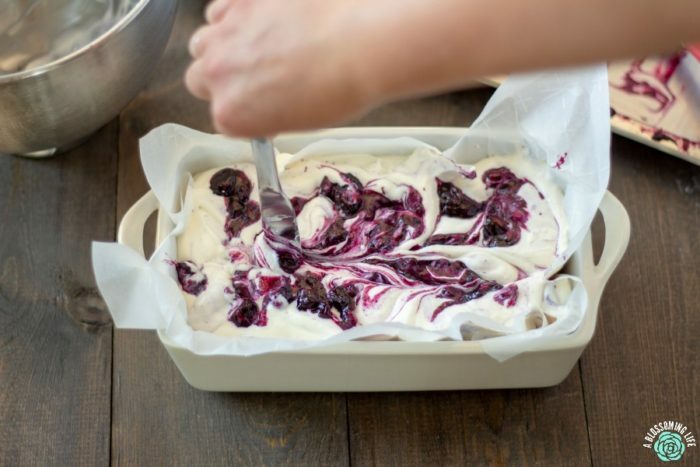 Take a knife or a spoon into the blueberry lemon cheesecake ice cream mixture and create zig zags and lines in the pan to lightly mix the ice cream and sauce together. Cover and place in the freezer for 4-6 hours. When you're ready to serve, allow the ice cream to thaw a bit and spoon onto cookies, place cookies on top, and enjoy. Or wrap them up for later. If you want to be a super awesome ice cream sandwich maker, you could freeze the mixture into a paper cup and then cut through the cup to make perfect ice cream circles. I tried making this ice cream by just mixing everything together. It is much tastier by adding spoonfuls of cream cheese and swirling in the blueberry sauce. 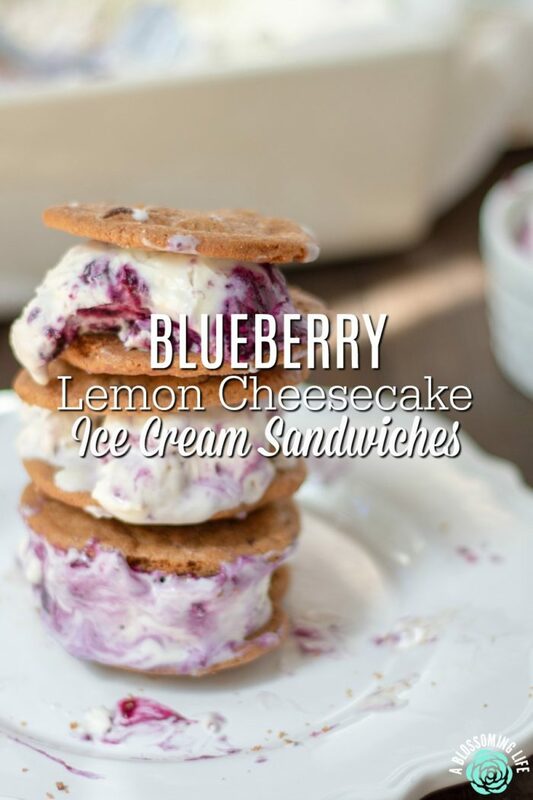 You seriously have to try these delicious blueberry lemon ice cream sandwiches. You will not be disappointed! And make sure to visit your local blueberry farm to pick your own blueberries, or find them at the farmer’s market. Thank you Oregon Blueberries for sponsoring this post. Me too! Yummm adding blueberries to Greek yogurt and kefir sounds so good. 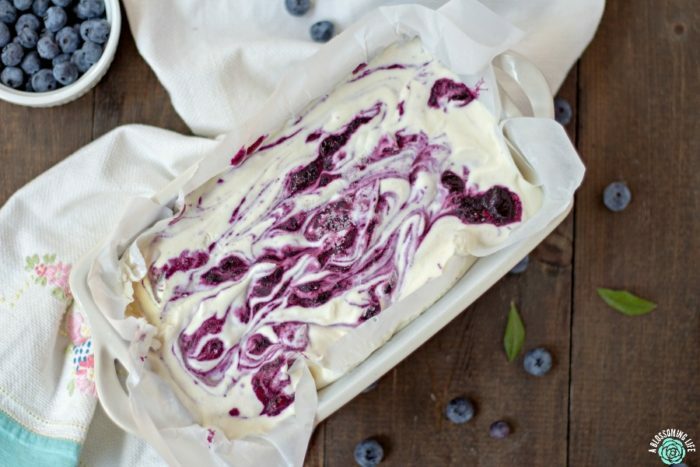 Blueberries are my husband’s fave… and so is cheesecake! This is definitely something I need to make for him: ASAP! He will love it! Basically a match made in heaven 😍.